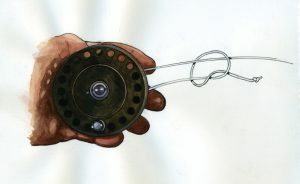 Twenty- and thirty-pound Dacron backing are good choices for a saltwater fly reel. LOSING a big saltwater gamefish after it is hooked and decides to head for the horizon is, in many instances, the result of filling your reel with backing that is either too short or too light. 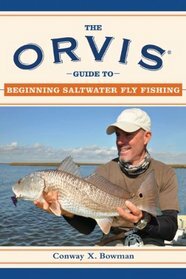 Twenty-pound backing is a good choice for most inshore saltwater fly-fishing situations, while thirty-pound backing is better suited for larger bluewater gamefish. 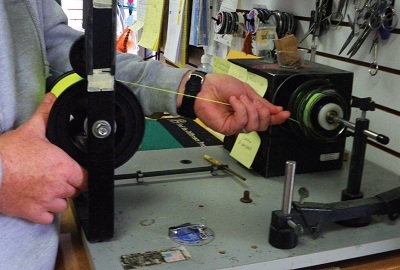 Since many inshore saltwater gamefish will make initial runs of seventy-five to one hundred yards before they turn and settle into fighting mode, your fly reel should hold a minimum of 175 yards of twenty-pound Dacron backing. For bluewater fly fishing, a minimum of 300 yards of thirty pound Dacron or gel-spun polyethylene is standard. Big bluewater gamefish such as tuna and marlin will run off 200 yards of backing before you have time to say, “Come back and fight like a man!” These fish can also dive to great depths, thus making essential an abundant supply of backing. 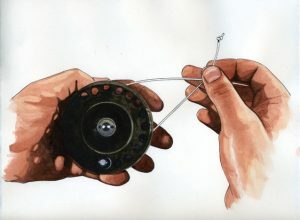 Many fly fishers don ’t know how to tie the backing to their fly reels. And why should they? Isn’t backing usually wound onto your fly reel at the time of purchase? 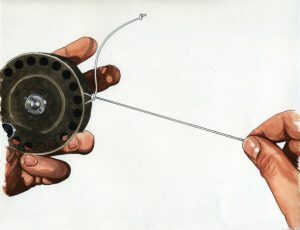 We have come to expect this courtesy from fly shops after buying a reel. 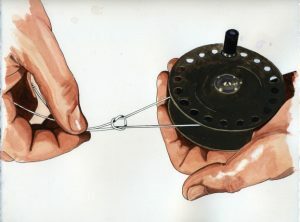 However, if you ever need to change your fly line and attach new backing to your reel and find yourself miles from the nearest fly shop, being able to do it yourself will not only save you a lengthy trip to town but will also afford you more fishing time. 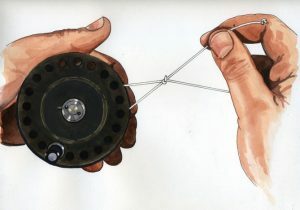 Gel-spun and Dacron backing have a tendency to slip once they are connected to the fly reel’s arbor. A good way to avoid this problem is to wrap a strip of blue medical or gaffer’s tape around the arbor before putting on the backing. 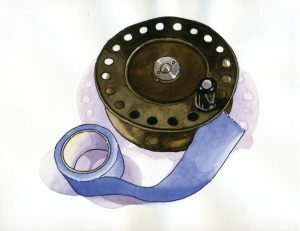 The tape’s surface will create just enough friction to prevent the backing from slipping as you wind it onto the reel. The Arbor Knot is a good knot for tying backing to your fly reel’s arbor. It is simple to tie and very low profile.